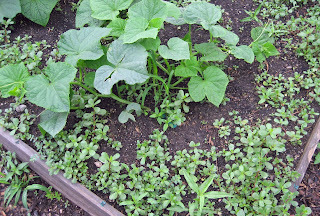 Not since Charles Dudley Warner wrote about purslane in his garden has there been a garden so infested with this weed as my very own vegetable garden here at May Dreams Gardens. He said they "grow as if the devil is in them", and I believe that to be true. Every single raised bed in my garden was covered with this, what shall I call it, as 'weed' is too nice a word. And wouldn't you know it, when the purslane was at its peak, an aunt and an uncle from out of town stopped by to see my garden. How embarrassing! Caught with my purslane showing. The garden shone in the morning sun, as did the purslane. For those who are now wondering, what does purslane look like, here it is. This is no ordinary weed. This is a weed that embodies all that we hate about weeds. It grows quickly. If a piece of it is left laying on the soil, it readily roots again. The seeds last forever and germinate into the tiniest, nearly impossible to remove, seedlings. 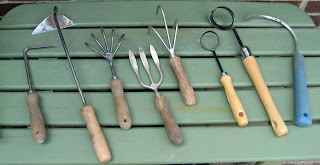 To take back my garden, I carefully chose my weapons. All of these are fine weeders, useful for different situations. But for the purslane, I used a combination of the Cape Cod Weeder on the far left, and the five prong cultivator, third from the left. Working through one bed at a time, I used the Cape Cod weeder to dig the purslane out with a digging/slicing motion, and then I cultivated the area with the five prong cultivator. I attacked the purslane, I embraced weeding. Doesn't this bed look much better? It took most of the afternoon, with a few breaks, to clean out all the beds. But as you can see, I have taken back the garden! I am back in control and the purslane is in a trash bag, waiting to meet its fate not in the compost bin but at the local city incinerator. And soon I'll reap the rewards of my labor and hard work. 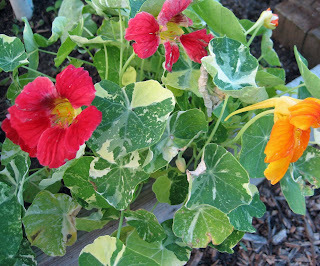 There are blooms a-plenty in the garden... squash, cucumbers, peppers, tomatoes and the nasturtium pictured above. 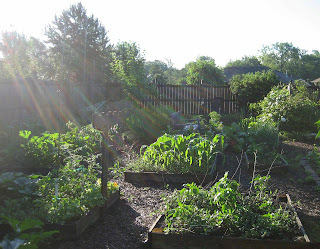 And to think that most of the garden was planted just a little over a month ago, on May 26. Some say that time stands still in a garden. That may be true some days, but in a vegetable garden, time sometimes runs as though there is a frost coming in a few months. Much better and you should feel very accomplished with such neat beds. We enjoyed visiting your garden, purslane and all. The vegetables and flowers towered with their beauty. Glad you got a handle on the garden today. It was a beautiful day for gardening in southern Indiana too and able to turn AC off. carol - im starting to see the first of the purslane this week in my garden. But, so far the bindweed has been way way worse. Great cleanup job! Hmmm. You might just have unwittingly tossed out the most nutritious crop in the garden. Purslane is edible, and high in Omega-3 fatty acids, of all things. Every since I read about this (in Michael Pollan's most recent book) I've been sort of hoping some would turn up here. No luck so far. Hmm...so that's what that weed is. Plenty around here, it's one of our staple weeds. Based on what sixty-five said, we always have a bumper crop. I wonder what it tastes like... someone wrote that here. One person's weed is another person's salad? Wow, my garden never looks like that! One thing puzzles me, though -- where is the mulch? Unless my eyes deceive me, that's bare earth. So who is going to be the guinea pig and try out a few recipes with the little devil? I hope that its prevalence in my garden isn't an indication that my soil is poor. I was thinking that the reason I had it was because I had some of the hybrid purslane one year and it had re seeded back to its origins. Beyond all this your veg. beds look wonderful. I have a couple of beds where purslane is my nemesis too. They are such a pain to pull since they are so tiny. And they start to flower before you even notice they are there. This year I don't see any weedy purslane in the vegetable garden, although I've got the cultivated Portulaca grandiflora, called Moss Rose in the smaller triangle bed and have the cultivated Portulaca oleracea, called Flowering Purslane, in containers. Is there scientific evidence that allowing the weed to grow diminishes the yield in a vegetable plot? Here's an interesting thread on purslane in the garden - some posters claim good results from allowing purslane to make a living mulch in the vegetable garden. I can't imagine either you or Charlie W. doing that, Carol! 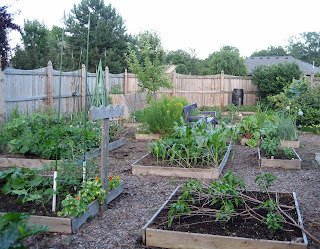 The pleasure of seeing beautifully groomed vegetable beds may be as important to you as the crop itself. How satisfying it feels to scan the orderly beds afterwards. Edible or not, in a short time you would have an all purslane garden, which would be a monotonous diet. I have purslane too. Being the nutritious girl I am, I eat it regularly with my peanut butter cookies. Not!! Lisa at Greenbow, thank you and I do feel better, and sleep better with the garden in order. Anonymous, Thanks, I enjoyed having you stop by! Gina, Yes, I'd say bindweed is worse than purslane. At least purslane pulls out easily, whereas bindweed... I shudder at the thought of dealing with it. Sixty-five, thanks for stopping by and I have heard about the nutritional value of purslane, but have never tried it. ChrisND, Yes, and if food prices get too high, this might turn in to a cash crop for me! Chookie, that's right, bare earth. 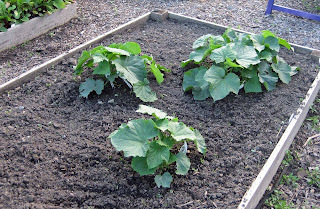 I don't mulch the vegetable garden beds. I probably should but I don't. Lancashire Rose, You try the purslane first and find some recipes, and then I'll try it, too. But you first! Daphne, Don't tell anyone, but I actually let it grow a bit so I can easily pull it. Annie in Austin, Perhaps those who are leaving purslane as an edible, living mulch are just lazy gardeners? I do like the look of the cleaned up beds, but don't look at the paths, they still need some work! Northern Shade, I agree! I think the plants already seem bigger today after I removed the purslane. Dee/Reddirtramblings, I know you were kidding about your nutritious meals! I love that japanese hand hoe, too, especially for removing sod. I've heard of purslane before--I thought it was something to eat! I don't know the names of most of the weeds in my garden, just that they seem to like it here. Thanks for identifying one of them for me. With such an arsenal as you have, it's a wonder any weeds dare to enter your garden! Rose, I do have quite an arsenal, but the weeds show up anyway. If you can't bean 'em, join 'em. Start a purslane farm and make a mint selling the stuff to high-priced restaurants. Why fight fate? It's a sign from God. 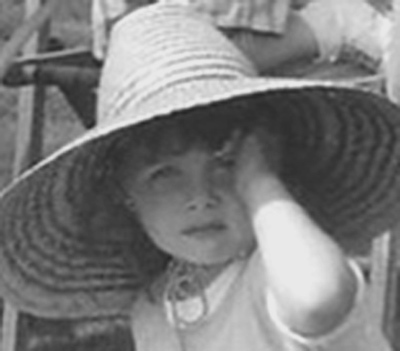 "Purslane shall inherit the earth..."
Finally this purslane story is beginning to unravel. We buy it here in the shops, and I have it in my fridgge right now. I had no idea it was so easy to grow that you all considered it a weed. Maybe bindweed is good for us too? (joking). I've got purslane, but the clover and this thing that lays very flat to the ground and creeps (don't know what it is) are my two worst weeds. There is a cultivated variety of purslane that is not invasive and has a more upright habit that is planted deliberately, but if you want it for eating, that's obviously not necessary! I finally cooked some up last night and it turned out great! Purslane really is a garden bane, but its edibility redeems it ... just a little. There is a study (available on line) that used purslane as a living mulch for broccoli. No decrease in the broccoli crop was observed/measured. I'm thinking about planting it as an understory in my apple orchard. I'll eat it as is, right out of the lawn. But then, I don't use chemicals on my lawn. Tastes green & fresh, nothing else. Like lettuce tastes green. Purslane is growing because you are leaving your soil bare. Nature doesn't like bare soil so repairs it with what you are calling weeds. Purslane is delicious, highly nutritious and FREE. Treasure it don't fight with it.